This is an example of CSS3 border-image in action. Browsers that don’t support it will see a normal solid coloured border, while modern browsers will see a nice framed border-image. Note that the clouds are produced with an additional background-image, showing the possibility of having separate images for borders and backgrounds. The border-image property is something I’ve been wanting for a long time. For years, I have been cutting up images into several pieces in order to emulate this effect (the most recent example of this was used in this demo of the CSS3 Font Converter). The difference is that CSS3’s border-image property uses only one image and two lines of CSS (well … 6 if you include the vendor-specific properties and the fallback for browsers that don’t support it). 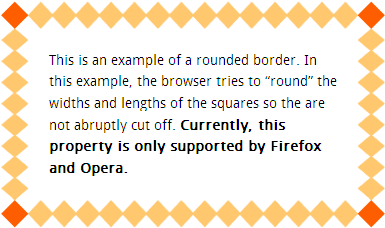 Since it is newly implemented in most web browsers, there are a few gotchas that developers should be aware of before implementing border-image. This article will cover these caveats, a tool that you can use to help generate border-images effectively, and a few things you should keep in mind so that pages don’t look funny in browsers that don’t support border-radius. * These border widths must match the border-image numbers. * border-image property don't have the 'px' unit at the end. * Lith for pointing this out). It is an edited version of an image produced by Free Printable Borders. Note that the image repeats to the size of the block it borders. When you design a border-image, the border should tile in a similar way that a background-image does. There are some major differences though, so let’s show in depth how border-image is used, and introduce you to the tool that will help even the laziest developer in the world (i.e. me) create them quickly. 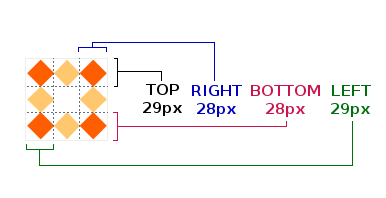 Note that if you are measuring your widths in pixels, then you must put the px unit inside the border-width declaration, but you must leave it out in the border-image one. I know it doesn’t seem logical, but it’s just the way it is. A diagram showing how the borders widths are ordered. (Note that the order of the border-image widths is consistent with the order that margin and padding uses). Now, let us apply effects on our image. This is an example of a stretched border. Note that the square in the corner remains intact, while the other squares are the ones that stretch. This is an example of a repeated border. You’ll note that the browser will apply symmetry on the border, so that it looks “balanced”. This is an example of a rounded border. In this example, the browser tries to “round” the widths and lengths of the squares so they are not abruptly cut off. Currently, this property is only supported by Firefox and Opera. But I Hate Counting Pixels! If you are the laziest developer in the world (i.e. me), you don’t want to crack open your graphics editor, open up a image file and count the pixels by hand – you want a tool that will generate the CSS for you. After all, don’t we use computers so that they will do things for us? At least, until they take over the world? I was in the middle of creating my own tool, but I noticed that Kevin Decker beat me to it with his excellent Border Image Generator. You can take any image, from the web or your desktop, drag a few sliders around, and voilá!, you have your code, vendor-prefixes and all. You should definitely check it out if you are as lazy as I am. * Note that all browsers use their respective vendor prefix. Now, why on earth would you want to use percentages, since pixels are probably more accurate? I don’t see there being any need for bitmap images, but Webkit browsers (i.e. Safari and Chrome) can use SVG vector images as a border-image as well. Since SVG images are resolution independent, I would assume it is more accurate to use percentages. It would be worth looking into percentage widths more when SVG border-image support reaches critical mass, since the other browser manufacturers may handle SVG support differently than Webkit. Screenshot of how the border-image example at the top of the page looks in Firefox. 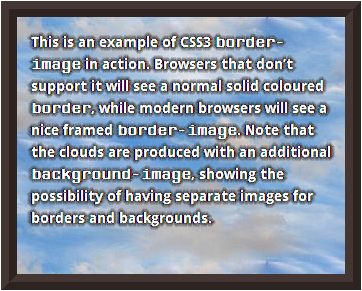 Screenshot of how the border-image example 'falls back' in IE9 using the ridge border-style. html.no-borderimage selector. I have done this using the comments section of my blog posts. Screen shot of comment on my blog using the balloon border-image in firefox (Click to see full screenshot). Screen shot of the same comment using modernizr to style the comment differently on browsers that don't support border-image (Click to see full screenshot). If you are using a border-image without a transparent colour or alpha channel, the center of your border-image will hide any background-image the object may have. If you want to have a separate background-image, you must “cut-out” the middle of the border-image using your graphics editor with a transparent colour. 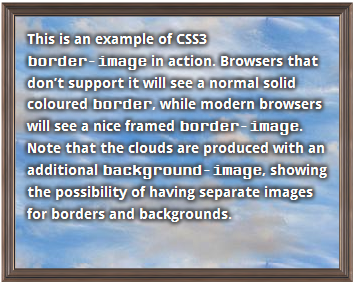 For instance, the example at the top of the page with the picture frame border-image has a photo of clouds as a background-image. This allows developers to create more graphically rich block-level elements. Unfortunately, IE doesn’t support border-image natively. I may have a workaround for this using cssSandpaper, but it needs a lot more testing to see if it is a truly viable polyfill for this effect. If I am successful, I will post whether that solution as an addendum to this blog post. border-image can be used today to make some very interesting effects that can be degraded gracefully in browsers that don’t support it. It can speed up design time considerably since you don’t have to use your graphics editor to cut up images. And I’m sure it will waste a lot of your time while you play and see how it can be used effectively. You mentioned that “(Opera and Webkit are similar, except for the stretch, which Chrome and Safari currently don’t support. )” – but Chrome does support stretch, as far as I can tell (I’m viewing this page in Chrome 12.0.712.0 and the stretch example looks identical to your Firefox screenshot. However, as you mention later, Chrome doesn’t support the rounded method. Regardless, thanks for explaining all of this and taking the time to show the various implementations. @Travis: Oops .. thanks for pointing out the typo. I meant to say that Safari and Chrome don’t support the round effect. Stretch is fully supported on Webkit browsers. I have made the correction. I was just looking at it yesterday with Lea Verou and border-image also is supposed to work with gradients. The biggest blocker for me is that there is no way to punch out the middle so borders actually remain borders and not become pseudo background images too (consider a case where you want a border image on a transparent element but the image used for border-image is in itself not transparent inside the border pattern like in the case of gradients). @Divya: Thanks for mentioning this! Cool stuff. Hopefully the other browsers will also be able to do this soon. I love this property. Appeals to the front-end designers big-time. Currently though Safari and Chrome use an improper beginning position for the side images when ’rounding’. Oh and FF and Opera are pixel perfect. @Dan: It is a known issue that round doesn’t work in webkit browsers. Hopefully this will be fixed soon — round is quite useful, especially if you don’t want to crack open a graphics editor to get your border-image pixel perfect. Another issue came to mind when I looked at (http://jsfiddle.net/nimbu/fbw2q/). I added border-radius and box-shadow. It looks correct at the bottom where it is totally transparent. Unfortunately at the top the border covers both the border-radius and box-shadow. When using border-image it is easy to make the image have the same combination of radii as the border-radius, so I’m sticking with image over gradient for the time being. You mean round works, but not correctly? @Divya Or the image you use for you border can have a transparent center. That is what I did on my site. The borders here in this site work perfectly for me (firefox 15.0), as well as some other random ones, but they simply won’t work other times, even in the editor, or the w3schools site (here http://www.w3schools.com/cssref/tryit.asp?filename=trycss3_border-image). I simply don’t get what is wrong. The fill works and shows, but no border at all. Any help with this? Other browsers show just fine, just firefox that refuses to do so… (and on a different computer too). Nevermind, the solution was adding a “border-style” with anything in it… Makes no sense, but fixes it. @Lith: I think you came across this bug that occurs in Firefox. It is important to always set border-style to something anyways, since it is a fallback for browsers that haven’t implemented border-image. Thanks for mentioning it — I am sure this is something other readers would come across, and I have updated the article to mention this behavior. Another Firefox bug (sigh… firefox is getting so disappointing lately, most of the issues I find are always there) is that if the page is too long and you are using the round value, after some time it will stop repeating and leave a blank space. I haven’t found a solution for this yet, however. If I do I’ll post it here.